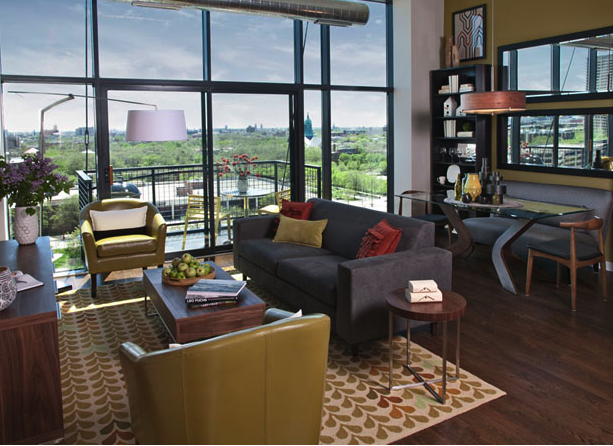 Model interiors designed by Mary Cook & Associates in the Van Buren Lofts in Chicago are built around lifestyle and incorporate her seven design fundamentals. 1. Function: “Whether we are planning for specific small-scale functions like study, rest, or family dining, or much broader functions like large-scale community interaction, careful thought needs to be given to those for whom the area is intended, realizing both the primary use of the space as well as the many possible alternate uses which may come into play,” she said, adding that many people expect multi-functional spaces now, too. “For instance, in a private residence, a dining table may also function as a desk, conference table, craft space or homework area,” she said. 3. Light: “General lighting plans mostly consider function and intended use of the space,” said Mary, who added that with “a deeper knowledge and understanding of the user demographic, it is possible to greatly increase activity and wellness by adjusting lighting accordingly.” She’s created environments that improve well-being, for example, by introducing lighting that mimics daylight. 6. Demographics: In order for any design concept to be successful, it should answer the who, where and what questions relevant to the project, says Mary. 7. Significant and Relevant Ornamentation: This fundamental, according to Mary, is “the final layer of interior design.” Assuming “appropriate attention to ornament and detail at the architectural stage has been completed,” she said, “ornament in a room should be of the proper proportion, and generally speaking, should pay homage to vernacular, architectural style, or heritage of the occupants, should be of relevance to those who experience the space, and should support an overall theme if in a public place. If in a personal place, the art and ornament need be of significance only to the owner, but should enhance the overall room by contributing to its harmony,” she said. To find out more about Mary Cook, visit her Web site.